Can’t remember how to spell a word? You can ask Siri to spell the word for you! 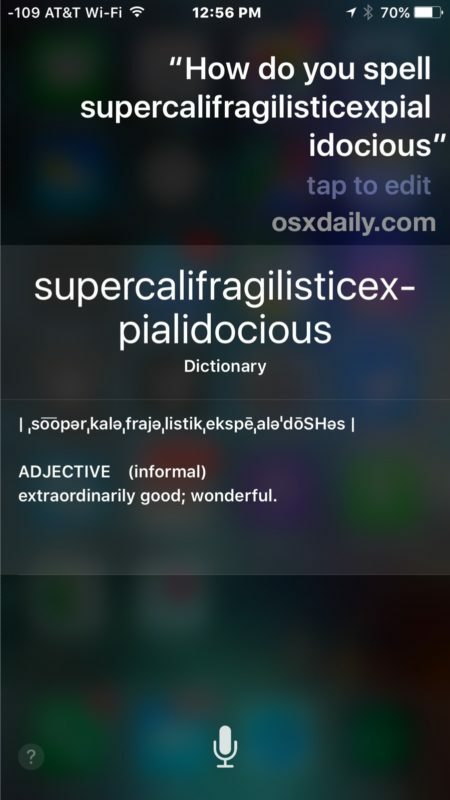 That’s right, good old Siri on your Mac, iPhone, or iPad has no problem helping you spell words if you can’t think of where to begin and when autocorrect is off or otherwise failing you, is this Siri feature supercalifragilisticexpialidocious or what? You’ll think it’s great too. 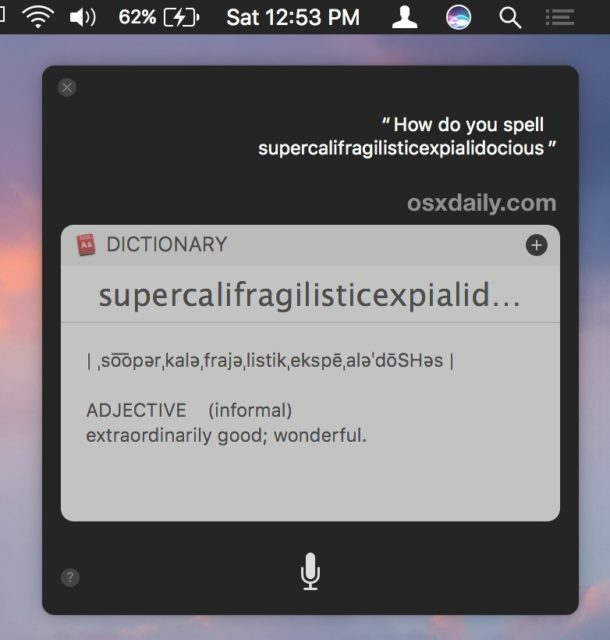 Here’s how you can stop fumbling with a confusing word and use this great Siri spelling trick on any iPhone, Mac, or iPad that has Siri enabled. This trick works exactly the same on iPhone, iPad, and Mac OS, as long as you have Siri you can use this. 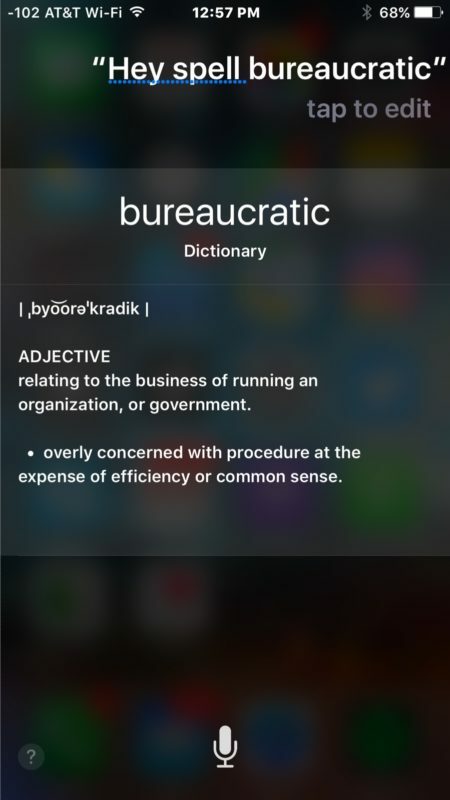 Siri will spell out the word, and also define it for you. Now you can type it accurately even if you don’t know where to begin, great stuff. This is just yet another handy Siri trick available in the always expanding massive Siri commands list for iOS, and there’s a slightly different big list of Siri commands for Mac with some desktop specific actions. The Siri word spelling is generally quite good but there are some failures, for example trying to spell “glycine” or “glycerinate” breaks it up into various weird word combos like “Glisan eight” or “Delight sunlight” – not quite what you’re looking for. Oh well… not everything is perfect! Have any other handy Siri tricks? Share them with us in the comments! This is an amazing trick I never knew! My husband neeeeeds this! I love your daily tips and tricks, I consider myself a fairly savvy tech user and I’m still frequently delighted at what I learn from OSX Daily! Thank you again, and keep ’em coming! Better still would be a more than less correct pronunciation of words, such as House-stun or Hugh-stun; René Descartes; Diedre, or Jocelyn …, there are others I can’t thunk of at the moment. Try the word thought, Siri never got it right! Good trick. But still not enough for me to turn Siri on. If Siri wants to impress me, she can get a job. Yet another idiotic “hint” to make society even stupider than it already is. All this proves is the dumbing down of the human race by the technology, and the failure of the educational system at the core level.